Murrieta, Calif.—In a special needs class at a southern California high school, each student received a handmade stocking packed with thoughtful gifts from a nearby senior citizen community. Lynette Meeker, who has a 15-year-old son in the class, was thoroughly impressed by the gesture, and the community behind it. “It’s amazing. They do this for a lot of special needs adults who are sometimes left out, and who can be very lonely,” she said. 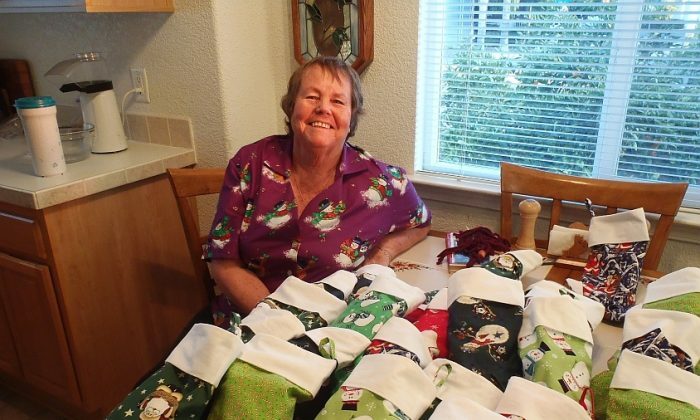 Larraine O’Canna made the stockings, and close friends helped fill them. She said the idea was purely spontaneous. Retired for 18 years, O’Canna is a skilled seamstress, and a self-described “sew-aholic” who makes quilts, purses, wallets, her own clothes, and does alterations for people in the community. A very social person, O’Canna lives in a 1,200 unit mobile home park in Murrieta Hot Springs. Once her friends discovered what she was working on, they wanted to help too. O’Canna stuffed each stocking with two mandarin oranges from her front yard tree, and a friend added packages of candy labeled “magic reindeer food” accompanied by a seasonal poem. Another woman made what looks like miniature hamburgers but are actually cookies sandwiched in a vanilla wafer bun. “They even had sesame seeds on the top of them. They were darling. Just precious,” O’Canna said. Seniors who lacked crafting talents gave more practical gifts. O’Canna’s 96-year-old friend, Sophie, added a single, crisp dollar bill to each stocking. A dental hygienist packed toothbrushes and toothpaste. Judith, who contributed her candy cane reindeer, said this community lives to help people. “Anybody who knows of a need to help anyone, whether they’re special need, or regular, or in the schools, or wherever the need is, people just pitch in and help and it’s wonderful fun for everybody,” she said. Meeker said the gifts were particularly touching because she knew the stories of the individual gift makers. “A lot of them are widows. A lot of them are dealing with very serious health issues. They are all senior citizens and it gives them a purpose. It gives them joy in a very lonely situation or a very painful situation,” she said. Carolyn, a friend of O’Canna for nearly 15 years, made jewelry box-sized containers fashioned from old Christmas cards that held two chocolate kisses. Nearly 80 years old, Carolyn lives by herself and works part time, but is still healing from a mastectomy she had nearly two years ago. Carolyn was slow to recover due to a shortage of professional care, and many believed she would never get out of the hospital. But O’Canna made sure she got back on her feet, helping Carolyn exercise every day until she came home. “I live in that kind of a community. Everybody watches out for everybody else. And if anybody has something that they’re doing, everybody wants to get their hands in it because they don’t have anything better to do,” she said. O’Canna is scheduled for full knee replacement surgery on Jan. 2, but said she can count on her friends when she gets back. “I know they’re going to be lined up at my front door wanting to take me to the doctor, or bring me a salad, or whatever. I just know it. I don’t even have to worry about asking anybody because I know they’re going to be putting up their hands saying, ‘Come on we’ll help.’ That’s the way it is,” she said. Gentle and charming, sweet and refined, Torontonian Miranda Zhou-Galati is nothing short of divine on stage.